It’s safe to say that Sebastian Keep and the Tall Order crew had a really good year. The brand got its launch in 2016 and they really stepped it up for 2017 with the team traveling a ton, a bunch of new products and more. This video looks back at some of the best riding, a few words from Sebastian and Oliver Jones about the year, a look at their new products they have coming and more. They’re also giving away a frame, so hit play and find out how to win. “Its been an incredible year! We worked hard on having fun and rode some unreal spots! To cap it off we have had a massive 10 MILLION VIEWS on our videos! WE ARE STOKED!!! 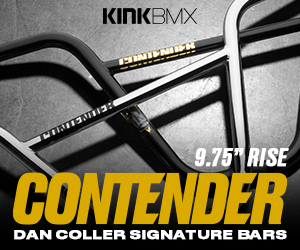 Here is the best of our 2017 along with a run through of tall order BMX products where YOU can WIN a tall order FRAME! The Tall Order crew have been notorious for going to some really ridiculous spots that not too many people are riding. Sebastian Keep decided to head to this insane spot they’re calling the Death Spine where Bas, Jack Clark, Tom Graves and Oliver Jones dodge some traffic and get some riding time in! This place looks like a ton of fun to ride, minus the fact that it’s way more likely to get hit by a car than to throw down a bunch of tricks, haha. After a little hiatus of videos from Bas Keep and the Tall Order crew, we find out just why. It turns out the crew loaded up for a trip after NASS to bounce around to a handful of trails spots, skateparks and surfing spots, yeah, you read that right. Above and below are 4 videos giving you a look at what they got into during the trip! “With Corey Bohan flying over from L.A to the U.k to ride NASS and stay a while we decided to go on the road for a few days in search of a man made wave in Wales and to ride Trails along the way. “In this Episode we arrive in Cambridge at Matt Priests house. Oli turns up out of the blue! We then ride a rad skatepark in Bury and Oli, Jack and Matt kill it! The Tall Order crew have been on it with the Webisodes lately. Here’s a fresh one where most of the crew got together for some skatepark and trails action. If you’re only interested in the riding, scroll forward to the 5 minute mark, that’s when things actually get rolling. “In this webisode we drove from Hastings to Essex to ride Jack‘s local Skatepark (Canvey Island) . On the way to Essex we had to make an emergency stop on the side of the busy A21 to search for something Jack had dropped out of his window! When we finally made it to Essex we learnt about how Jack nearly DIED riding after throwing up blood after a massive crash!